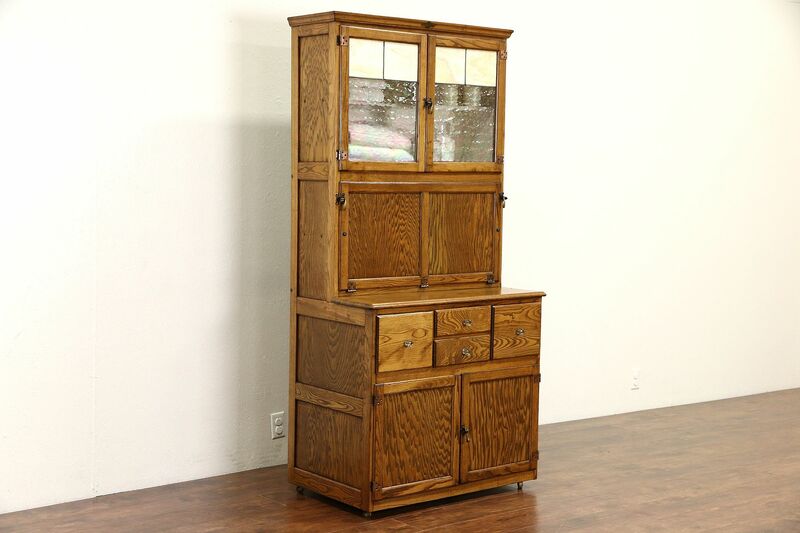 Signed "Hygena" of Liverpool, England, this 1930's oak "Hoosier" style kitchen cupboard was also used by a physician as a medical cabinet. Hygena is the Greek god of health. Textured iridescent leaded stained glass panels have two hairline cracks, see photos. The restored finish is in excellent condition on this British made vintage furniture. A drop down front has a porcelain enameled work surface. The interior is old paint, hardware appears original on this one piece cabinet. The back is tin and there is a tin bread drawer as well. See 30 photos that enlarge to full screen size.